Douglas Sterrett's 1911 USGS report on the mineral's discovery, geology, mining, and properties. 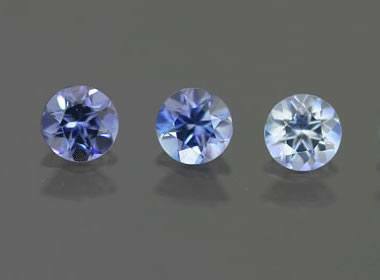 Faceted Benitoite: Five tiny gems of faceted benitoite in a color gradient set from nearly colorless to violetish-blue. Each stone is a round brilliant of about 3.5 millimeters and weighing about .20 carat. Photo by TheGemTrader.com. Benitoite and Neptunite Crystals: This specimen is a plate of translucent blue benitoite crystals and black neptunite crystals on a background of white natrolite. (This association is typical and an important characteristic of the mineral.) The crystals are about 2 centimeters in length and the plate measures about 15 x 11 x 2 centimeters in size. The specimen is from the Dallas Gem Mine, San Benito River headwaters area, New Idria District, Diablo Range, San Benito County, California. Specimen and photo by Arkenstone / www.iRocks.com. Benitoite is an extremely rare mineral that is best known for being the official state gemstone of California. It is a barium titanium silicate mineral, usually blue in color, that is found in rocks that have been altered by hydrothermal metamorphism. Its chemical composition is BaTi(Si3O9). Benitoite’s identification and original description was based upon specimens found in the headwaters of the San Benito River, in San Benito County, California, from which it received its name. Small amounts of benitoite have also been found at other locations in California, Arkansas, Montana, Australia, Czech Republic, Japan, and Romania. The only location where gem-quality material has been found is in San Benito County, California. Because of its rarity, gemstones and mineral specimens of benitoite are extremely expensive. It is a mineral rarely seen in jewelry or gem and mineral collections. Color Most specimens are violetish-blue. Some specimens are colorless. A range of color and saturation between colorless and deep violetish-blue occurs. Rare orange heat-treated specimens are known. Diagnostic Properties Tabular dipyramidal crystals. Intense blue fluorescence under short-wave ultraviolet light. Associated with serpentine and albite, but more importantly with rare minerals such as natrolite, joaquinite, and neptunite. Uses Gemstone, collector mineral, Official State Gem of California. Benitoite has an appearance that is very similar to sapphire. Its blue color and pleochroism are very much like sapphire’s. Benitoite and sapphire have overlapping refractive indices, but benitoite has a much higher birefringence, which often shows birefringence blink. Sapphire has a Mohs hardness of 9, while benitoite is much softer at 6 to 6.5. Benitoite has a specific gravity of 3.65, compared to a specific gravity of 3.9 to 4.1 for sapphire. Benitoite is usually found in association with other rare minerals, which include natrolite, joaquinite and neptunite. An excellent description of the new California gem mineral, benitoite, has recently been given by G. D. Louderback, of the University of California. The locality was visited during the summer of 1909 by the present writer, and every facility was given for the examination of the deposit by the Dallas Mining Company through the kindness of Mr. Thomas Hayes, at that time acting superintendent. The following description has been abstracted in part from Doctor Louderback's report and notes supplied from personal observation have been added. The difficulty mentioned by Doctor Louderback in learning who was the original discoverer of the benitoite property was encountered by the writer. It is evident that J. M. Couch, of Coalinga, grubstaked by R. W. Dallas, was instrumental in finding the deposit. Whether he discovered it while out alone or on a second trip with L. B. Hawkins, of Los Angeles, is a point in dispute. Material taken to Los Angeles by Mr. Hawkins was pronounced volcanic glass and valueless. According to Mr. Couch, specimens given to Harry U. Maxfield, of Fresno, were shown to G. Eacret, of Shreve & Co., San Francisco, and to G. D. Louderback. Specimens cut by Mr. Eacret were thought to be sapphire. Doctor Louderback found the material to be a new mineral and named it benitoite after the county in which it was found. Benitoite mine map: Map showing the location in San Benito County in central California. The benitoite mine is in the southeastern part of San Benito County, near the Fresno County line. The deposit is about 35 miles by road northwest of Coalinga in the Diablo Range, about three-fourths of a mile south of Santa Rita Peak, and on one of the tributaries of San Benito River. The elevation of the mine is about 4,800 feet above sea level; the elevation of Santa Rita Peak is 5,161 feet. The mine is in the end of one of the branching ridges from the south side of Santa Rita Peak. The end of the southward extension of this ridge is a low knob about 160 feet above the creek. This knob is called the apex, and from it a small spur extends to the west down to the creek. The benitoite mine is in the south side of this spur, about 50 feet lower than the apex and 250 feet west of it. The benitoite deposit occurs in a large area of serpentine which extends many miles northward past the New Idria quicksilver mine and a few miles southward, and forms the summit of an anticlinal ridge pitching down to Coalinga. This serpentine is of the usual type of the Coast Ranges and presents different phases from hard dark-green and greenish-black material to softer lighter-colored rock containing more or less talcose and chloritic minerals. Slickenside seams and lentil-shaped blocks and masses are common through the serpentine, much of which is decomposed near the surface and breaks down to light grayish-green soil which has a greasy feeling when rubbed between the fingers. Inclusions of masses of schists and other rocks of the Franciscan formation occur in the serpentine. These schists may be micaceous or more basic, having common hornblende, actinolite, or glaucophane as characteristic minerals. The benitoite deposit is located in one of these basic inclusions, a portion of which has a somewhat schistose structure, while the rest is nearly massive. These phases were probably originally different adjacent formations that have been metamorphosed. Part of the massive form is a dark-gray to greenish-gray rock that might be called trap. In some specimens the following minerals are determinable under the microscope: augite, plagioclase crushed and recrystallized and containing clinozoisite prisms, secondary albite, yellow serpentine, and a little titanite and pyrite. The rock is therefore a partly metamorphosed diabase or gabbro. The more schistose phases are grayish-blue to blue and grade into vein material. They are composed of one or more varieties of hornblende, some partially chloritized, with albite, and, near the vein, with natrolite. The hornblende occurs in minute needles, felted masses of needles, blades, and stouter prisms. These have a bluish to yellowish green to nearly colorless pleochroism, and are in part probably actinolite and in part glaucophane or allied hornblende. The natrolite fails and the albite is also less abundant in the hornblende rock at some distance from the vein. The vein is a highly mineralized shattered zone in the schistose rock. The fractures and joints with the vein filling are about parallel with the schistosity of the rock, which averages nearly east and west in strike with local variations and has a varying dip of 20° to 70° N. A sketch map of a small area on the benitoite mine hill giving the outcrops with their dips and strikes and the formations encountered in the mine workings shows the schist and gabbro inclusion in the serpentine to be quite irregular in shape. The width at the mine between the serpentine walls is about 150 feet and at a distance of 150 feet east of the mine it is only about 90 feet; about 80 feet farther east at the apex it is over 100 feet. This schist inclusion has been described by Kalph Arnold as 150 feet wide at its widest point and at least 1,200 feet long. The metamorphism of the schist inclusion has been of two kinds — first mashing and sheeting of the original basic rock producing schistosity and opening channels for solutions and then a passage of mineral-bearing solutions recrystallizing and replacing the minerals of the rock with albite. The albite permeated the rock for many feet each side of the fracture zone. The conditions of temperature or pressure of the solutions became changed, so that natrolite was next deposited. The natrolite did not permeate far into the rock, but formed a coating on the walls of the fissures. Neptunite and benitoite were formed with the natrolite at this stage in the fissures and openings but did not penetrate the wall rock. This whole mineralized zone containing many bands and masses of natrolite with gem minerals in the joints, fissures, and open spaces in the brecciated hornblende rock may be called the vein. The unfilled cavities and seams in the vein zone aided by later fractures and faults has offered an easy passage for more recent decomposing meteoric waters. The latter have leached portions of hornblende schist along and included in the vein, have removed part of the minerals of the vein, and have stained the natrolite on the walls of the cavities and seams with iron and manganese oxides. The rock, leached of albite, has a more or less porous texture and is composed principally of fine fibrous blue hornblende and actinolite. Benitoite crystal structure: Crystal structure of benitoite, BaTiSi3O9, P-6c2, projected onto the (a,c) plane. Public domain image by Perditax. Development work at the benitoite mine at the time of the writer's visit consisted of a large and a small open cut, a prospect drift or tunnel with a crosscut tunnel, and an incline shaft. The large open cut or "glory hole" was 20 to 45 feet wide, 85 feet long, and from a few feet to 35 feet deep; it had a north of east direction into the hillside. The smaller open cut was to the north side of the entrance of the larger cut and at a lower level, it was about 60 feet long and 10 to 15 feet deep. The prospect tunnel was driven 120 feet in a direction N. 70° E. from the end of the large open cut. The crosscut tunnel was 45 feet long and driven to the north at a right angle from the main tunnel at a distance of 50 feet from the mouth. The incline shaft was sunk 35 feet deep from the north side of the open cut at about the middle. The prospect tunnel cut through the hornblende schist formation into decomposed serpentine. The contact was evidently a fault line, and near it the serpentine contained much talcose and scaly asbestiform material. The fault was directly across the schistosity with a north-south strike and a. dip of 45° W. This prospect tunnel encountered a little natrolite (vein material) in the hornblende schist in its upper west side, 15 feet beyond the crosscut tunnel, which crossed a small streak of vein material containing a little benitoite about 10 feet from the main tunnel. Vein material formed the roof of the prospect tunnel for several feet near its mouth. The "glory hole" was excavated in a very large pocket or bulge in the vein, a portion of which may still be seen along the north wall of the open cut. The incline shaft was apparently sunk in the lower part of this outcrop and did not encounter benitoite. The smaller open cut exposed vein material with benitoite, which was more plentiful near the east end of the cut than at the west end. The vein and the schist in this cut were much blackened and stained with films and seams of manganese dioxide. About 30 feet S. 60° E. of the upper end of the huge open cut a ledge of altered blue hornblende schist outcrops prominently. This ledge also carries a streak of natrolite with benitoite. Benitoite has been found in bowlders a few hundred yards west of the mine on the hillside and in the creek. These bowlders have evidently rolled from the outcrop on the hill above and probably from near the mine. Doctor Louderback states that benitoite lias been found for a distance of about 230 feet at the surface along the mineral zone and in very small quantity at its extremes. The writer observed benitoite in place through a distance of about 170 feet in an east and west direction. The strike of the ledge outcropping to the east of the open cut was about N. 60° W., with a high northerly dip. The strike encountered in the tunnel, about 30 feet lower and to the north, was nearly cast and west with a dip of about 40° N. In the upper part of the face of the open cut the dip was high, about 65° N., and below the middle of the face it was low, 15° to 25° N. Along the north side of the open cut and in the lower cut the strike was about east and west and the dip was probably rather low, 20° to 30° N. These measurements do not agree closely with those of Doctor Louderback, especially in regard to the dip of the vein. Jointing of the rock and the irregular nature of the vein, however, make accurate measurements difficult. Doctor Louderback places the dip at 65° to 69° N., but the dip measured by the writer is much lower, probably 15° to 30° N. in the lower part of the cut. The evidence for this measurement is found in the position of the vein at the outcrop and in the tunnel, of the layers of blue schist and natrolite in the end of the cut, and of the ledge along the north side of the open cut and in the lower cut. Such a low dip would account for the failure of the incline to cut the mineralized zone. The failure might also be due to the pinching out of the vein a short distance below the large pocket opened in the "glory hole." The impression gained by a study of the deposit and by plotting the location of the vein where encountered in different places was that the deposit consists of an ore shoot pitching to the west and lying in a fracture zone in hornblende schist with an irregular east and west strike and north dip. This shoot had a lenticular cross section with a thickness of more than 25 feet in the thickest part but pinching out on the sides. The upper edge of the shoot has been removed by erosion. A portion of the lover edge was encountered in the tunnel. The eastern extension of such a shoot would have been removed by erosion and the western extension would be underground, to the north of, west of, and below, the open cut. Doctor Louderback mentions the outcrop of spheroidal gabbro on the southeast of the benitoite deposit on the hillside. The outcrop of rock on the north side of the vein zone, on the summit of the ridge, is of a similar nature and has been mentioned above as diabase or gabbro. The same rock was encountered in the crosscut tunnel 40 feet below the surface and 30 feet north of the main tunnel. Underground this rock occurred in large loose spheroidal bowlders ranging up to several feet in thickness, with large openings between them. This material was difficult to mine and required careful timbering. The open spaces evidently extended to the surface above, as a strong draft of air came through them. The spheroidal shape of the blocks and the open spaces between them were doubtless formed by decomposition and leaching along fracture planes. 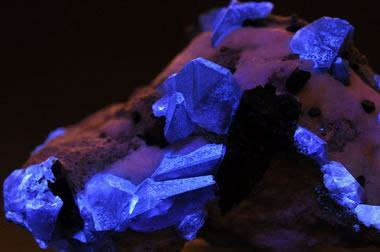 Fluorescent benitoite: This is a photograph of small benitoite crystals under ultraviolet light. The mineral exhibits a brilliant blue color under ultraviolet radiation. Public domain photo by Parent Géry. The benitoite occurs with neptunite in crusts, seams, and thicker deposits of white natrolite on the walls of geode-like cavities and fissures in the hornblende schist. These deposits occur in both irregularly shaped masses and in seams with more definite directions. They inclose fragments of hornblende schist which has been heavily impregnated with natrolite. In some of the inclusions the gradation from the hornblende rock containing much natrolite to natrolite containing acicular inclusions of hornblende is complete. The benitoite is embedded in or attached to natrolite, being in some places completely, in other places partly, enveloped by it. In the latter places the benitoite projects into the cavities along with the coarse drusy surfaces of the natrolite. Natrolite with or without benitoite and neptunite fills some of the fissures and former cavities completely. The benitoite is always in contact with natrolite and has not been found embedded in the hornblende rock alone. It is in many places attached to hornblende impregnated with natrolite and is partly or completely inclosed in natrolite on the remaining sides. The neptunite is subject to the same relations with the natrolite and is, in places, partly surrounded by benitoite. These facts point to the same period of formation for the three minerals with the power of crystallization arranged in the following order: neptunite, benitoite, and natrolite. The benitoite is obtained by breaking open masses of vein rock and carefully chiseling or working the crystals out of the inclosing natrolite. Many gems are injured or ruined by this method. The removal of the natrolite by acid has been tried with partial success. Large slabs of rock 2 to 3 or more feet across are obtained coated with natrolite and carrying benitoite and neptunite. The last two minerals are either visible on the drusy surface of the natrolite or are completely covered by natrolite. The position of the benitoite and neptunite is often marked by lumps or a thickening of the natrolite crust. By carefully cutting into these lumps beautiful crystals are sometimes uncovered. Often the inclosing crust or shell of white natrolite can be split from a crystal of neptunite or benitoite in two or three large pieces, so that the covering can readily be replaced over the crystal. Such material makes beautiful specimens. Slabs of bluish hornblende rock with a drusy pure white crust of natrolite containing brilliant reddish-black neptunite and blue benitoite in fine crystals are excellent for the same purpose. The minerals associated with benitoite are described and analyses are given in the paper of Louderback and Blasdale. Neptunite is titanium silicate containing iron, manganese, potassium, sodium, and magnesium. It occurs in black to reddish- black prismatic crystals of the monoclinic system, the length commonly being several times the thickness. It has a prismatic cleavage and the thin splinters or powder show a deep reddish-brown color. The hardness is between 5 and 6 and the specific gravity 3.18 to 3.19. Neptunite is practically insoluble in hydrochloric acid. The natrolite, with which the benitoite and neptunite are associated, does not generally occur in distinct crystals of any size. It forms massive granular white aggregates of crystallized material with curved ridge-like or cockscomb-like groups of crystals and drusy botryoidal masses in the cavities. Natrolite is a hydrous silicate of sodium and aluminum crystallizing in the orthorhombic system. Other minerals occurring in smaller quantity in the cavities are emerald-green copper stain, amphibole needles, albite, aegirine, and psilomelane. The amphiboles are actinolite, a variety intermediate between crossite and crocidolite, and a little glaucophane. The chemical and physical properties of benitoite and its associated minerals have been described by Louderback and Blasdale, and the following notes are taken from their description. 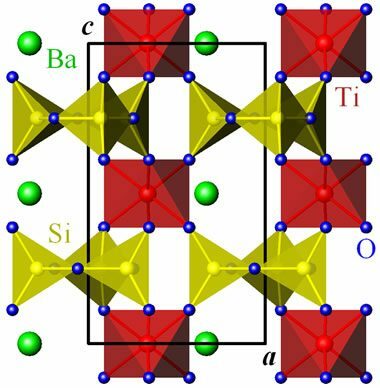 The chemical analyses show it to be an acid barium titano-silicate corresponding to the formula BaTiSi3O9 . Benitoite is insoluble in ordinary acids, but is attacked by hydrofluoric acid and dissolves in fused sodium carbonate. Alone, it fuses quietly to a transparent glass at about 3. The color of benitoite is not affected by heating the stone to redness and allowing to cool. The hardness is greater than orthoclase and less than peridot, or about 6 to 6 1/2, and the specific gravity is 3.64 to 3.67. Benitoite crystallizes in the trigonal division of the hexagonal system. The common forms observed are the base c(0001), trigonal prisms m(1010), and n(0110), and the trigonal pyramids p(1011) and π(0111). Other forms are rather rare and of small importance. Of these faces the pyramid π generally has the largest development. This gives the crystal a triangular aspect with the corners truncated by smaller planes. The prism faces are narrow, though generally present. Many of the crystals are naturally etched on one or more sets of faces. Such faces are a little dulled or slightly pitted. Benitoite has an imperfect pyramidal cleavage and a conchoidal fracture. Faceted benitoite: Three blue stones of faceted benitoite. Benitoite is often cut into round brilliants because of its high refractive index and dispersion. Cutters must orient benitoite carefully to take full advantage of its pleochroism. Photo by TheGemTrader.com. The mean refractive index of benitoite is greater than that of sapphire, and measures 1.757 to 1.804 (sapphire 1.759 to 1.767). The birefringence is high and the pleochroism very strong. The crystals are generally transparent with a pale to deep-blue and bluish-violet color. Color variations are common in the same crystal, and the change from dark to light blue or colorless may be sharp or gradual. The pleochroism of benitoite is pale to dark-blue or purplish and colorless. The richest colors are seen when the crystals are viewed parallel to the base. The intensity of the blue diminishes as the light ray penetrates the crystal at other angles until perpendicular to the base, when the crystal is colorless. Care is necessary, therefore, in cutting the gem so as to secure the best effects. Pale-colored stones should be cut with the table perpendicular to the base or parallel to the vertical axis of the crystal to secure the full color value. Deeper colored stones may be cut in the same way or with the table in an intermediate position, if the color is very strong. By cutting intensely colored stones with the table only slightly out of parallel to the base, the color may be reduced to a desirable shade. The dichroscope may be used to determine the position of the vertical axis and accordingly of the base perpendicular to it. When viewed perpendicular to the vertical axis with a dichroscope the twin colors or two rays of light are very intense to pale blue (depending on the depth of color of the crystal) and colorless. When viewed parallel to the vertical axis, or perpendicular to the base, the two rays are colorless and remain so while the dichroscope is rotated. The color of one of the rays becomes stronger as the crystal is rotated from this position. Benitoite crystals exhibiting two shades of color, as dark and light blue or blue and colorless in different parts of the same crystal, may be cut so as to show these variations, or sometimes in such, a way that the resulting color is of nearly uniform intensity. Benitoite has been cut as a brilliant, with the step or trap cut, and "en cabochon." The brilliant cut is especially suitable to show the brilliancy and fire of the gem. The brilliancy is due to the high refractive index and the fire or red flash, often seen in dull or artificial light is, in part at least, caused by the dispersion of the mineral. Of the colors produced by dispersion during the refraction of light in benitoite yellow and green are largely absorbed in the colored gems so that principally red and violet-colored lights are seen. These flashes of colored lights along with the natural fine blue of benitoite render the gem particularly beautiful. The step cut displays the color of benitoite to advantage, with only slight loss of brilliancy. Cabochon-cut gems from crystals with color variations or partially flawed material have some beauty. The size of the gems cut from benitoite range in weight from a small fraction of a carat to several carats. According to Doctor Louderback the largest perfect stone so far cut weighs over 7 carats and is about three times as heavy as the next largest flawless gem so far obtained. The majority of larger cut stones weigh from 1 1/2 to 2 carats. The principal production is in stones weighing less than 1 1/2 carats. The use of benitoite in rings or jewelry subjected to hard wear is limited by its comparative softness. The beautiful color, brilliancy, and fire of the gem, however, adapt it to other classes of fine jewelry. Since the supply of benitoite is thought to be limited and a fairly large demand has already arisen for the gem, it is probable the price will be kept high, possibly as high as that of sapphire, its nearest rival in color. 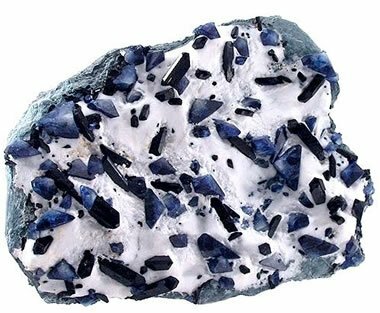 Benitoite, article on the mindat.org website, last accessed October 2018. Benitoite, by Douglas B. Sterrett, in Gems and Precious Stones, Mineral Resources of the United States, Calendar Year 1909, Part II Nonmetals, pages 742-748, published 1911. Benitoite Gem Mine, San Benito County, California, by Brendan M. Laurs, William R. Rohtert, and Michael Gray; article on the Collector's Edge website, accessed October 2018. So far benitoite has been found at one place only. J. M. Couch, one of the original discoverers of the benitoite deposit, has located several prospects in formations resembling that at the benitoite mine. In one of these, three-fourths of a mile to the north on the east side of Santa Rita Peak, cavities lined with natrolite crusts and crystals have been found in a bluish hornblende schist rock very similar to that at the original mine. The schist near the vein is composed of bluish hornblende and actinolite needles penetrating granular masses of albite. This rock also incloses crystals of natrolite showing that part of it was formed later than or during the crystallization of the natrolite. In the cavities the natrolite occurs in simple well-developed white columnar crystals up to a centimeter or more in thickness and several times as long. Neither benitoite nor neptunite have been found associated with this natrolite.